NBC Universal has announced a deal with Lion Forge Comics that would bring beloved shows from the 80s, including Knight Rider, back in comic form. They have tapped Geoffrey Thorne (of Leverage, Ben 10) as a writer and Jason Johnson (of Wetworks, Godstorm) to illustrate. 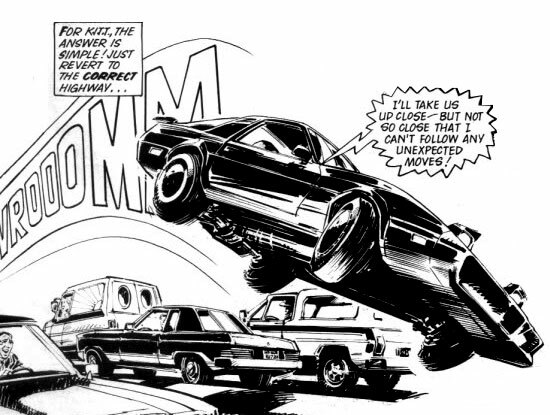 Not much is yet known about how much these comics will align with the Knight Rider many of us grew up with. However, when asked by Knight Rider Archives about this Geoff Thorne did say that it would be a "reboot. but you'll find all of it very familiar." We expect to find out more at San Diego Comic Con in two weeks. When knight rider on tv again?